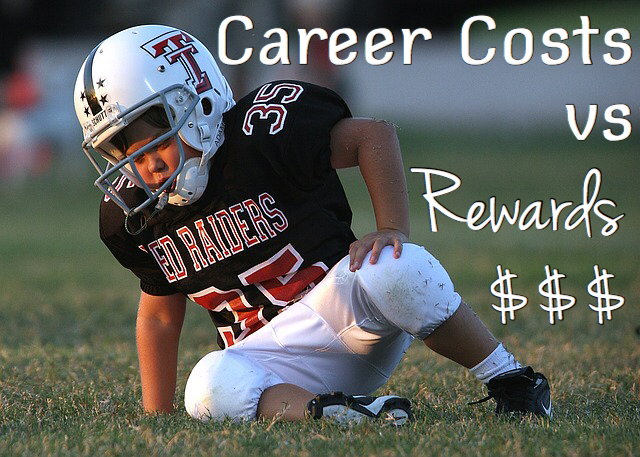 Career Costs vs Rewards – Are You Sacrificing Too Much? Have you evaluated whether your career costs outweigh the rewards? Yesterday, as I was watching the Dallas Cowboys beat the Washington Redskins for only their second victory in 17 attempts without starter Tony Romo, my viewing experience kept getting interrupted. My phone delivers updates from NFL Mobile and over the course of the afternoon, I received updates on player after player with injuries severe enough to keep them out the remainder of the game. It’s nothing new that football has more than its share of injuries. I have personal experience as a player starting around the age of eight up until eighteen. I saw fellow players with injuries ranging from bumps and bruises, to broken and dislocated bones, to torn ligaments, to a broken neck. There is an expression that goes something like, “dancing is a contact sport, while football is a collision sport.” And as the bodies get bigger, stronger, and faster, those collisions get more and more violent. Injuries are a part of the sport. And at the professional level, the players go in knowing this. But they decide that the rewards of a career in professional football are worth the risks they take. Which brings me to the point of today’s article. What are you willing to risk or give up for your career? And what do you expect to gain in return for your sacrifices? While the rewards of your career are clear – money, benefits, enjoyment, prestige – there are many career costs that you pay for these rewards. Health. In the case of football, the health risks are significant. Other careers that pay well also may have very high risk of injury or death. But for most of us, the health risks of our careers are stress, high blood pressure, and lack of time to exercise and eat well. Traffic. Most jobs require a commute of some sort. Whether you’re driving, taking a bus, a train, or a plane, you may find that spending so much time in traffic builds frustration. Travel. Along those same lines, many careers require business travel. A few trips here and there may not be so bad and you might even find them enjoyable. But generally business travel is time-consuming and a hassle. And too much of it will again drain your energy. Family time. Long hours spent in the office working takes away from time spent with your family. What’s the cost of that sacrifice? Children that you don’t know and who don’t know you. A disconnected marriage. We all know people whose family life has suffered because of career demands. Personal time. We all need time for ourselves. When you’re pulled in too many directions by different competing forces, you start to feel the stress. You start questioning whether it’s all worth it. And everything suffers. While most careers don’t carry as significant a risk of severe injury as professional football, there are always career costs which require sacrifice in some form. And while most careers also don’t have the financial rewards and prestige of professional football, you are always forced to decide whether these career costs are worth those rewards. I heard an interesting story the other day about Urban Meyer, the coach of the Ohio State University football team. Previously, coach Meyer was the head coach at the University of Florida. At the peak of his career, he left that position because football had overtaken his life. He spent all his time thinking and living football to the detriment of his health and family. And the only thing that saved him was getting away and figuring out a different approach. Finding the right balance that works for you not only improves yourself and your family life, it may also improve your work. We tend not to perform at our best when we’re too stressed or preoccupied with other thoughts. Figure out what works and do whatever you need to get there. Readers, what are your career costs? Are you sacrificing too much? Did you reach that level and decide to make a change? There is a certain amount I sacrifice right now, but it is still very much worth it as we near FI. For me it’s a matter of getting out before the sacrifice becomes too big. There’s a point you reach when the sacrifice outweighs the benefits. Hopefully, when that happens you’re in a position to step away. On our path to financial independence the current sacrifice should be worth the long term benefits of freedom. It surely is a balancing act and we are constantly evaluating if it is still worth it. We actually are debating if one of us actually should stay home once the little one goes to school in 2017. In that scenario one of us would be home when she gets out of school. We have reached a point in our finances where this should be very much feasible, albeit delaying the ultimate point of financial independence for the greater good of the little one. Sacrifices, eh? We went through the same evaluation when our first was born. And actually, Ms. FS had a letter of resignation written and ready to go. But instead, she floated the idea of working part-time from home. They agreed and she has been working from home since then. It’s been a good way to stay working and still be around with the kids. That’s a big sacrifice. When I worked in Chicago, I knew many people that had a two-hour commute. Like you, they chose to use the time to work on various other projects, but it’s still impressive. I used to tell those people that I commuted less than they did even though I was flying in every week. When you added up my travel time it was a little less than the 10 hours per week that they endured coming in five days per week. A good question to ask. What are we giving up for what we get? My career has a few changes to increase the quality of life, each time, I gave up status and money for a better life. Non the less, I gave up a few years of FIRE… I now have to work longer to become FI. Actually, I am not sure FI is my real goal, Freedom is. That comes at different levels. I still have to pick mine. That’s my thinking as well. I am going to write more about this topic in a future post – Financial Independence vs Retirement vs Freedom.